Soar high above Juneau's lush Tongass National Forest, as you enjoy a 40-minute panoramic seaplane flight, capturing spectacular glaciers and fjords from your window seat. 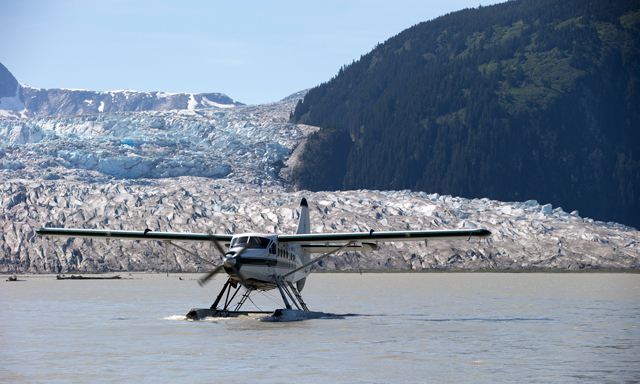 Delight in picturesque Alaskan views, while enjoying headset commentary about five glaciers you'll see while flying over the massive Juneau Icefield, home to more than 30 named glaciers. View Norris glacier, Hole-in-the-Wall, paired East and West Twin glaciers, and Taku, the world's deepest and area's only advancing glacier. • Commentated Seaplane Ride: See Juneau's spectacular scenery by air, with a window seat and informative headset commentary. • Tongass National Forest: View the largest national forest in the United States, with striking fjords, mountain peaks, and abundant wildlife. • Juneau Icefield: Fly over five glaciers in this massive frozen expanse, including the only advancing glacier in the area, Taku. • This tour includes approximately 40 minutes of flight time. • Each guest enjoys a window seat and headset for narration. • Payment will be processed onboard your ship.